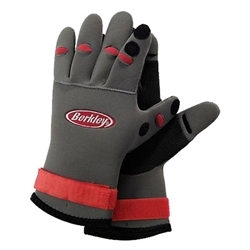 Berkley's Neoprene Fish Grip Gloves have a no-slip texture grip that allows you to hold on to the slipperiest of fish. These Gloves are heavy duty to withstand fish handling hazards, yet flexible enough to use your hands with ease. The secure velcro wrist closure fits over most jackets and coats and are buoyant if dropped overboard or in water. Just simply clean with soap and water then drip dry.